It has been revealed that when Electronic Arts contacted Respawn Entertainment to work on Star Wars Jedi: Fallen Order, the developer was already working on an unannounced game. Respawn made the executive decision to halt development on this title, switching development to Star Wars Jedi: Fallen Order instead. It is unclear what game Respawn was working on, but Game Director Stig Asmussen said that all of this started when EA approached Respawn and asked if this Star Wars game was something that the team would be interested in making. Asmussen said that the decision was unanimous among the team. Titanfall 2 is a good example of what Respawn can do. Whether you are piloting a Titan, or traversing levels using the game’s wall running mechanic, Respawn has experience crafting worlds that can be explored in interesting ways. As such, I am curious to see just how Respawn will use this experience when making Star Wars Jedi: Fallen Order. Star Wars Jedi: Fallen Order is set to release on the PlayStation 4, Xbox One, and PC on November 15, 2019. Little is known about the game, other than some details on its story. Set after the events of Star Wars: Episode 3 Revenge of the Sith, you play as Cal Kestis. Cal is an abandoned Padawan who must complete his Jedi training, learn new Force abilities, and master the art of fighting with a lightsaber, all while trying to lay low in order to avoid the Empire’s Inquisitors. In case you are unfamiliar with them, Inquisitors are tasked with hunting down the remnants of the Jedi after Order 66 was executed. 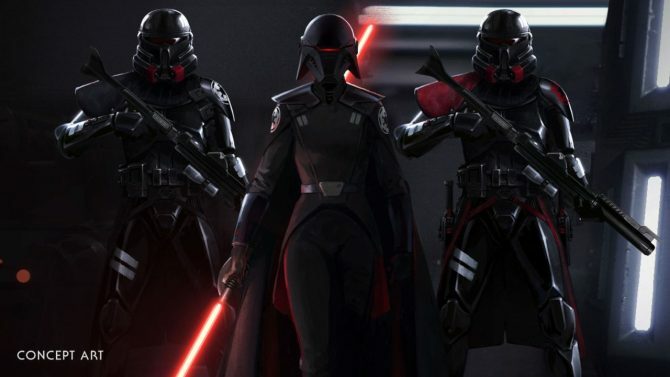 Are you excited for Star Wars Jedi: Fallen Order? Let us know in the comments below!